In spring 2008, the world woke to banner headlines describing a global rice shortage. The news was grim for that half of the world that relies on the grain as its primary food staple. When price increases exceeded 50 percent in just two weeks, people in poor nations like Haiti rioted over the higher food costs that threatened their very lives. The political and economic repercussions were just as dramatic. Rice-producing nations like India banned exports. The world’s poorest populations, increasingly dependent on the crop as other grains have become too costly, scrambled for international financial help. Countries like South Korea that emphasize industrialization over agriculture saw a measureable shift in their balance of trade. The shortage was caused by two global trends coming together—rapidly growing urban populations and an annual 3.5 percent decline in world rice production. Gene Stevens, an extension associate professor in the Division of Plant Sciences at the College of Agriculture, Food and Natural Resources, University of Missouri, is directing the project in Portageville, Mo. Stevens is a member of the Commercial Agriculture Crops Team at the College’s Delta Research Center. He is looking at what irrigation, fuel and fertilizer methods are needed to grow rice with center-pivot sprinkler irrigation as compared to traditional flooded field “rice paddy” methods. 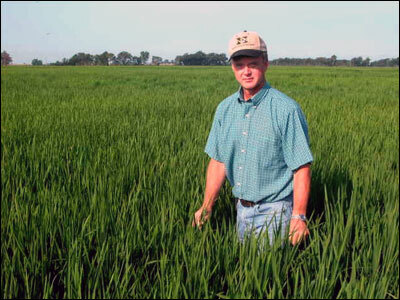 One of the main functions of growing rice in standing water is weed control. In the United States, rice fields are usually flooded with two to four inches of water one month after planting. While this ancient practice has been successful, it limits rice growth to areas adjacent to rivers and streams. This fixed acreage is being reduced globally due to urbanization pressures. Also, water is becoming scarcer in most rice producing regions. Problems like drought in Australia are adding to the woes, too, causing farmers there to shift to less water-intensive crops. In an effort to conserve water and allow rice plantings on fields where production is currently not possible, Stevens and his colleagues are determining the best mix of fertilizer, planting options and water application. The team is also looking at the best ways to minimize the need for fuel to power irrigation pumps and farm machines, another significant challenge in making the new method economically viable. The creator of center-pivot irrigation, Valley Irrigation, a division of the Valmont Industries … Expand ▸The creator of center-pivot irrigation, Valley Irrigation, a division of the Valmont Industries based in Omaha, donated the center-pivot equipment used by the Delta Center. The research is being funded through a grant from the Missouri Department of Natural Resources. Center-pivot irrigation, also called sprinkler irrigation, was invented about 100 years ago to water the semi-arid American Great Plains. It employs a long sprinkler arm that rotates around a pivot. Viewed from an airliner, the device creates distinctive circular crop patterns. It is extensively used in states such as Nebraska to irrigate corn. Center-pivots can range in length from 500 yards (circle radius) to the more common quarter-mile. The sprinkler arm is fed with water from the pivot point at the center of the circle. An outside set of wheels sets the master pace for the rotation, typically once every three days. The Missouri effort expands on a decade-long Brazilian experiment raising rice under center-pivot irrigation. So far in that country, water usage has been halved and the harvest is 20 percent bigger. But the reason for the flooding in the first place, weed control, has not been easily fixed there. Heavy amounts of herbicides and nitrogen fertilizer are needed in place of the flooding. In developed countries, that adds up to significant production costs. In developing nations where money for such chemicals is hard to come by, citizens are stuck using ancient techniques on whatever fields can be flooded. Even with the problems, center-pivot irrigation is too water-efficient not to pursue. Soil moisture levels can be monitored and water applied only when needed. Where traditional flooding-irrigation saturates the ground throughout the growing season, center-pivot irrigation can be curtailed during rainy periods in the growing season. Center-pivot irrigation also reduces labor which boosts the farmer’s bottom line. Many hours of work are required to construct levees and install flood gates for flooding rice fields each year. Center-pivot irrigation also helps the farmer practice minimum tillage. This could lead to reduced runoff and greater soil productivity. Crop rotation and minimum tillage bring organic material back into the soil and reduce the high levels of compaction coming from years of growing nothing but rice. For a hungry world where more rice is an imperative, center-pivot irrigation can even help increase the amount of land currently in production. Because channels and berms associated with flood irrigation aren’t needed, existing fields can be enlarged within their current dimensions. Gene Stevens, plant sciences extension associate professor, in a flooded rice field. Unfortunately, the hardware being studied in Missouri can’t just be exported to rice-growing nations alone. Knowledge of the best use of planting techniques, herbicides and fertilizer use must also be part of the deal. This is what the scientists in southeastern Missouri are looking to quantify and publish. For example, Stevens and his team found that one species of pigweeds, Amaranthus palmeri, became resistant to a family of herbicides in the Delta Center test fields. “This was a setback for us at first until we identified the problem and switched to other another type of control practice which has been effective,” Stevens commented. 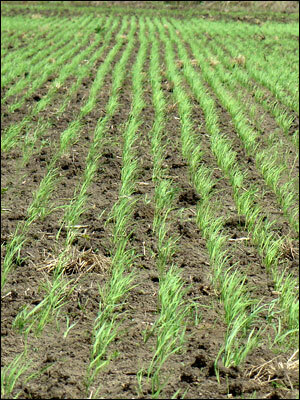 Another challenge to center-pivot irrigated rice is nitrogen management, Stevens said. As the Brazilian experience shows, the amount of nitrogen fertilizer needed to maintain production yields can go up as water irrigation is reduced. One objective of the Missouri research is to determine the optimum balance between water and nitrogen based on soil type and climate. 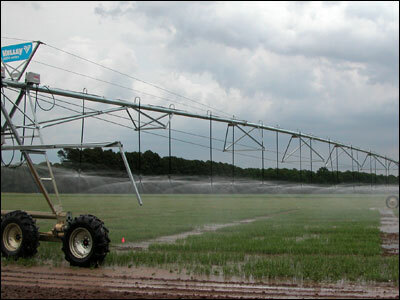 The Missouri experiment is being conducted using a linear-moving center-pivot sprinkler irrigation system located on a Tiptonville silt loam soil field. A control farm using conventional flood irrigation is located at Delta Research Center’s Lee Farm. Rice in both locations was planted in early May 2008. To determine the optimum blend of water and fertilizer, different plots of rice receive a similar amount of water but varying amounts of fertilizer—ranging from zero to 225 pounds of total nitrogen per acre. Stevens is also studying using fertigation, liquid fertilizer applied in the irrigation water, to spoon-feed the rice. The control farm uses standard flood irrigation and with the same nitrogen treatments. To provide objective data to gauge the success of nitrogen and irrigation applications, overhead digital images of the rice plots are recorded and processed with a unique software program to determine the percent of green pixels—the healthy, growing plants. Yardsticks were placed between drill rows and visible numbers are counted to estimate canopy development and nitrogen demand. The plots will mechanically harvested with total yield measured as well as the percentage of complete and broken grains. Rice field at Delta Research Center. While these techniques promise to increase rice production globally, they may also boost Missouri’s agricultural economy by planting more acres of an ever-increasingly important export crop. In the U.S., more than 100 varieties of rice are commercially produced. Missouri is one of six states along the Mississippi River that can produce the product. In the 2006 crop year, domestic rice production was valued at $1.88 billion, approximately half of which was exported. The U.S. provides about 12 percent of rice that moves in world trade. The majority of domestic utilization of U.S. rice is direct food use (58 percent), while 16 percent is used in processed foods and beer. The remaining 10 percent goes into pet foods. The Anheuser-Busch Brewery in St. Louis is the largest consumer of rice grown in Missouri.